Answer: Santa Rosa and Calistoga. Just over an hour’s drive from San Francisco is California’s world renowned wine country. Millions of tourists and local Bay Area residents make the pilgrimage to Napa Valley each year to sample the latest vintages coming out of well-known and lesser-known establishments like Silver Oak or Trinitas Cellars, respectively. But there are other gems to be found in Napa and Sonoma County, beyond wine. And, at this time of year, you can enjoy the sunny California weather without the crowds. Here is my rundown of how to spend an unusual, grape-free long weekend in this beautiful part of the country. Last month, I treated my husband to an African safari for his birthday. But it wasn’t in Africa (although I have promised to take him back with me to Botswana, Zambia and Zimbabwe one day). Instead, this adventure was in Santa Rosa at Safari West – the self-proclaimed Sonoma Serengeti. And, unlike the very basic tent I used in the Okavango Delta, the one provided at Safari West was glamping at its best; complete with wood floors, electric blankets, an outside deck, and an en suite bathroom with hot running water. Best of all were the animals, which serenade overnight guests with their morning calls – some even visible from your tent, depending on where you are located. You also get to see countless hoofed mammals during the two hour off-toad driving tour across the 400 acre preserve. If views are your thing, then Calistoga is a great place to take to the skies in a hot air balloon. Just be prepared to get up super early and remember to layer up as it can be quite chilly in the wee hours. Our ride with Calistoga Balloons started with a launch right next to Old Faithful (see #3, below). Talk about a unique perspective! While it is possible to see geysers throughout the world, there are supposedly only three that have the designation “old faithful”, and one of them is located in Calistoga. Other than size, the main difference between the Old Faithful in Yellowstone National Park and the Old Faithful Geyser of California is the amount of time you have to wait between each eruption. During each of my visits over the past few years, it has taken between 5 and 20 minutes for the natural water display to begin – something that is extremely convenient when I have little ones with me. In addition, there is a cute little petting farm to help distract the kids before the “show”. If you have ever made it to Yosemite or taken a drive through Big Sur, you will no doubt have been in awe of the majestic redwoods that populate this part of California. But now imagine these colossals as they would have looked 3 million years ago. That is the experience that the Petrified Forest in Calistoga offers – although the perfectly preserved stone fossils leave little to the imagination. 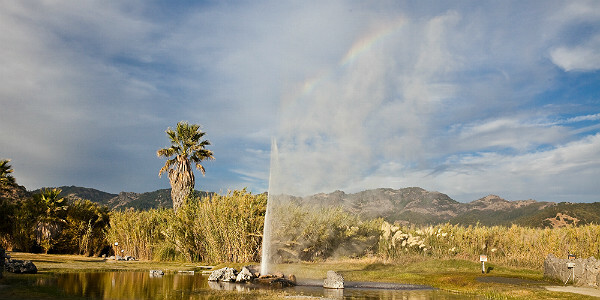 No trip to Calistoga would be complete without a visit to one of the many hot springs in the area. My personal favorite is the mineral pool located at Indian Springs, which is available to spa and hotel guests alike. However, if staying at one of the fabulous onsite cottages is not in your itinerary, certainly consider a trip to the spa instead. The massages are great and the mud bath is certainly a unique experience. When you head back to San Francisco, think about stopping at Brix for lunch on your way out of town. The food and setting is truly magnificent, and Sunday brunch is to die for! How To Get There: The closest major airport, San Francisco International Airport (SFO), is approximately 70 miles from Santa Rosa and Calistoga. It is easier and cheaper to fly there and rent a car, than it is to fly to the Santa Rosa regional airport. San Francisco Airport is served by over 40 domestic and international airlines. Information regarding area transportation is available here. Best Time To Visit: Although summer is the most popular time for tourists, it is often characterized by fog and wind – so pack a sweater — and be prepared to pay higher hotel prices during this peak season. September and October, as well as spring months, tend to have the most pleasant weather. But year-round, although temperatures are moderate, visitors should prepare to dress in layers. One of the best times to visit is during the less-busy winter, which coincides with holiday shopping and lower hotel rates.